I can’t remember the last time it took me over a week to finish a 300-page book. Maybe sometime when I was horribly sick? On an extended vacation? Generally speaking, if I’m taking over a week to read a single book, it’s because said book is at least a 500-page brick. Thus, I’m puzzled as to why I struggled so mightily to maintain focus on The Fishermen. I was invested in the characters, four brothers initially united but eventually torn apart by a decision to defy their parents and go fishing in a river reputed to be cursed. I appreciated the folk tale-y, timeless quality of Obioma’s writing. I enjoyed being immersed in Nigerian culture, so foreign but somehow instantly recognizable. It’s probably just me. As I’ve mentioned before, I’m in the thick of a big transition into a full-time job. In my former life, I could have muscled through my distraction and wrapped up the book in a couple days. But right now I’m still in that place where I come home every day after work with motivation left for nothing but strapping on a feed bag and rambling about my day to my husband. The Fishermen, for whatever reason, wasn’t calling to me from my bag begging to be read, or if it was, I couldn’t hear it over the TV. So admittedly, maybe this month wasn’t the best time for me to attempt this book. Maybe I should have stuck with something a little lighter, more consumable. 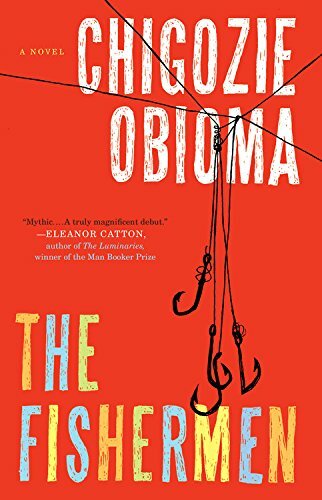 Still, there’s a lot to like about Obioma’s debut novel. The four brothers at the center of the story are pitted against each other by a prophecy made by a madman. Everyone in the village agrees the man is insane, but they’re superstitious enough they can’t quite discount everything he says. The man has been right just enough times to lend himself a terrifying credibility. The boys’ relationships may never recover from the threat of the future, real or imagined. The Fishermen is a dark tale of family love and betrayal, heavy with portent and foreshadowing. You can feel the momentum of the tragedy to come, even if you’re not sure whether it will take the exact shape the madman predicted. The comparisons I’ve seen to the Biblical Cain and Abel story are certainly apt. If I’d been able to muster up an attention span longer than a fruit fly’s, this book would have really been firing on all cylinders for me. Next time I’ll be sure to bring my A game.